The Footwear Industry in Bangladesh has started since the colonial era, although its modernization took place only in the late 1980s. During the British period, there was no footwear manufacturing firm producing on a mass scale in East Bengal. However, a traditional cottage type footwear industry with limited production facilities existed in a skeleton form in the district towns during that time. Various types of footwear were imported, mainly from Calcutta. After the partition of Bengal in 1947, foot wears were imported from West Pakistan. When Bata Shoe Company established its manufacturing plant at Tongi in 1962, it was the first manufacturing plant to produce shoes on a large scale in East Pakistan. In 1967, Eastern Progressive Shoe Industries (EPSI) established its production plant. It began exporting footwear to USSR, Czechoslovakia and England. Both Bata and EPSI held major shares in the local footwear market. The footwear industry suffered a major setback during the war of liberation but was rehabilitated after independence. New footwear manufacturing units have recently been established. Among them are Apex Footwear, Excelsior Shoes, and Paragon Leather and Footwear Industries. Japan and Germany are now the biggest markets for Bangladeshi footwear but US buyers are increasingly showing interest in sourcing from Bangladesh. Bangladesh could have a billion dollar footwear export sector by 2013, claim local shoe manufacturers on the basis of both the current growth in shipments and the increased production capacity in factories under construction. If their assessment is correct, in a three-year period the level of exports can increase five-fold from the $205 million worth of shoes that were exported in the last fiscal year that ended in June 2010. Bangladesh has a host of potential products that can earn substantially large amounts of foreign exchange, if only the necessary patronage from the overseas buyers is given for the sake of expanding the country’s export base and thereby reach a sustainable status for the country’s export trade. Recently, a new opportunity has opened up to further diversify the range of Bangladesh’s export base by including footwear and other leather goods in the list of exports particularly to the European Union (EU) market. However, the country has already been exporting finished leather and different kinds of leather products to the overseas markets. These products also enjoyed considerable demand because of their high quality. The main reason for this was the natural advantage of leather that Bangladesh produces. Despite the high quality of local animal hides both in raw and finished form, Bangladesh was still trailing behind Vietnam and China in the export of footwear and other leather products in the European and other markets. Bangladesh is set to emerge as the next manufacturing hub for the global footwear industry. The cheap labor is prompting top manufacturers to relocate their factories in the country. The good news is that a number of foreign investors as well as buyers have already shown interest in Bangladesh’s leather and footwear sector. Recently, the president of the Bangladesh Finished Leather, Leather Goods and Footwear Exporters Association (BFLLGFEA) informed all concerned that three large investors in the footwear sector from Taiwan would set up footwear factories in the Dhaka and Chittagong Exporting zones. The buyers from EU, as well as other very highly developed industrial nations like Japan have reportedly been showing importance in Bangladeshi leather products. All these developments look promising for the local footwear industry. The Export Processing Zones at present have 18 shoe and leather goods factories but there are at least seven large factories under construction, mostly owned by big manufacturers in the shoe world. The factories under construction include Korean company Young one’s footwear complex which is said to be the largest in Asia. The company started construction of its mega shoe complex in Chittagong six months back. The first part of the complex will go into production by the middle of next year, and the company’s executives said they would be able to manufacture about 30 million pairs of shoes by 2013. In addition, Taiwanese shoe manufacturer Pau Chen, which employs about 4,00,000 workers in its factories in China and 50,000 in Vietnam, is also building a large manufacturing facility in Chittagong. Australian manufacturer Bonbon Shoe, a supplier to Hugo Boss, and Xen Chen and Genford of Taiwan., are also building footwear factories in Bangladesh. Apex-Adeichi also has a new factory that will soon start production. With an annual turnover of about $100 million, the Bangladesh-Italy joint venture is now the largest exporter of footwear. However, with a new joint venture factory, Blue Ocean Footwear, due to go into production by February 2011, Apex will get involved with a turnover of nearly $200 million of footwear export by 2013. The local footwear industry is experiencing an annual growth rate of 21 percent, according to a spokesman from another apex organization, Leather Goods and Footwear Manufacturers and Exporters Association of Bangladesh (LGFMEAB). However, to continue the trend, the present level of growth has not only to be attained; it also has to be taken to a still higher level, if Bangladesh is to match the success of its immediate competitor, Vietnam. According to a newly released statistics from the Export Promotion Bureau of Bangladesh, footwear exports from the country grew from US$61 million in the period of July-November 2007 to $85 million in the same period of 2008, recording a growth of 39 percent. In the first four months of the 2010 fiscal year there has been $98 million worth of exports, a 65 per cent increase from the same period last year. Taking this rate of growth into account, shoe industry executives estimate that the current fiscal year’s footwear export is likely to cross $300 million. Though in the next two years the existing factories are likely to export more shoes, it is the new capacity that will come on stream from early 2011 that is expected to cause the huge spurt in growth. Growth in exports is due to the low production cost in Bangladesh compared to its neighboring countries: China, India and Vietnam, who also have a very well entrenched leather and footwear export industry. Orders which earlier used to be given to China or India are now being handed out to footwear manufacturers in Bangladesh because they are able to produce low-priced but quality shoes, which have now found its way in to key markets in EU and Japan. This growth in footwear exports has come as a blessing in disguise at a time when leather exports have fallen by a massive 18 percent in the period under review. Experts attribute the growth in footwear exports, thanks to machineries imported from Italy that is trusted for its quality output. In recessionary trends, high-priced products tend to register a negative growth, as consumers tend to shy away from them in preference for value for money items. In this scenario, it is a golden opportunity for the leather and footwear sector to increase its global market share. Bata Shoe Company was founded by the famous entrepreneur Mr. Tomas Bata who blew the wind of change in the footwear industry in 1894. The company was started from Zlin, Czechoslovakia, now known as the CzechRepublic. From that day onwards Bata Shoe Company has been the largest manufacturer and marketer of footwear in the world. The global business of Bata comprises of shoe factories, tanneries, engineering plants, quality control laboratories, product development and research centers. Bata has developed a strong distribution channel all over the world through the establishment approximately 6,300 retail outlets, 10,000 franchise and thousands of depots and dealers. More than 50,000 people are directly involved in the production and selling of over 300 million pairs of shoes each year. Bata Shoe Company manages a retail presence in 55 countries, and runs 40 production facilities across 26 countries. Bata international headquarter is located in Switzerland which was previously located at Toronto, in Canada. Bata Shoe Organization companies are involved in every facet of the business of shoes. Throughout the world, Bata services customers from the store sales floor to the factory floor. Bata Shoe Organization companies have built successful retail store concepts to satisfy changing consumer tastes and needs. Each store features merchandise targeted to different lifestyles and people. The merchandise ranges from footwear to clothing and goods complementing shoe offerings. Sensitivity to and satisfaction of customer wants and needs has allowed the Bata Shoe Organization (BSO) to become a world leader in footwear. Tomas Bata’s revolutionary business concept was to industrialize the shoemaking process of that day. That type of thinking has been the driving force behind the Bata Shoe Organization success. The Bata Shoe Organization has been an innovator in the manufacturing of shoes over the years. Bata personnel have made important advances in DVP (Direct Vulcanization Process), PVC, athletic footwear production and slush-molded footwear production. The Bata Shoe Organization [BSO] enjoys a unique position in the wholesale marketplace. Global economies of scale enable BSO plants to offer quality products at local prices, with many are operating at ISO standards. Bata Shoe Organization production facilities are world renowned for their commitment to quality and customers, and have attracted production contracts from many international footwear brands. Throughout the world, the Bata ® brand distinguishes well-made and well-priced footwear. Many core articles for Bata ® branded collections are designed in product development centers in Italy, the Far East and Canada. Designers and merchandisers in Bata Shoe Organization companies broaden the collections by developing complementary styles to reflect tastes, budgets and climates within their own market. Strict quality controls govern the selection of materials and all production stages. Bata is operating business in five business units such as Europe, Asia Pacific, Latin America, North America, and Africa. Bata announces its worldwide presence through these five business units. Bata Shoe Organization started its operation in Bangladesh in 1962. The company was incorporated in 1972. The company is affiliated to the Bata Shoe Company, the largest footwear manufacturing and marketing organization. According to Bata Bangladesh website (2010) it is mentioned that currently, Bata Bangladesh operates 2 manufacturing plants at Tongi and Dhamrai, have production capacity of around 110000 pairs of shoes daily. It has a modem tannery with the latest technological facilities to process 5 million square feet of leather yearly. The Tannery is equipped with a high-tech effluent treatment plant ensuring a pollution free environment for both workers and the environment. Bangladesh’s regional headquarter is located in Singapore. Bata is playing a pivotal role in developing the leather industry of the country. Bata has a firm commitment to eco-friendly business and a state of the art Effluent Treatment Plant (ETP) has been set up to provide a pollution free environment for both workers and the locality. Fashion would never be complete without a well designed pair of shoes. This marketing insight has prompted Bata to introduce a number of designers’ collections for men, women and children. Internationally renowned brands such as Bata Comfit, Marie Claire, Hush Puppies, Scholl, Nike, Bubblegummers, Sandak, Weinbrenner and B’first are a few names that testify to the momentous change towards branded shoe marketing in Bangladesh. Specialized shoe categories such as athletic shoes have been targeted through development of the Power brand. Uncompromising quality with striking designs have put Bata shoes in a key position to appeal to different segments of consumers. Another major change in the Bata business policy is the segmentation of retail outlets according to profiles of different market segments and the introduction of novel concepts such as Bata City Stores. These selective outlets, in conjunction with other types of outlets such as Bata Bazar and Bata Family Stores, are adding a new level of consumer satisfaction. The City Stores incorporate spacious floor space allowing a comfortable shopping experience, modem interior decor enriched with novel shelving systems, fittings, fixtures and lighting that can be found in the large retail shops in the Far East and Europe. Bata has a network of 242 retail outlets located strategically in different parts of the country. These retail outlets are an integral part of our brand marketing. This extensive retail network is supplemented by an equally extensive network of depots and dealers. Bata has 13 Wholesale depots covering Bangladesh. Under these depots 390 RWD (Registered Wholesale Dealers) and 553 DSP (Dealer Support Program) stores are operating. Bata Bangladesh has already developed its vision up to 2013 showing significant business growth as well as increased market share. One of the critical areas associated with external shareholders and the community at large is the Corporate Social Responsibility Program of the company. From supporting nationwide sports sponsorships and disabled persons to addressing environmental concerns, scholarship programs, charity contributions etc — Bata has always supported individuals and communities in need. Partnerships with other voluntary and charitable organizations are another prominent feature of Bata’s corporate social responsibility. Bata, in partnership with CARE, extends assistance to over two thousand rural women in order to become independent entrepreneurs in the Rajshahi, Comilla and Chittagong division selling shoes from door to door under its Rural Sales Program. Since its inception, Bata Shoe Company (Bangladesh) Ltd. has strived towards one goal — customer satisfaction. With the vision of building a worldwide family of satisfied customers and dedicated workers the legacy of Tomas Bata continues strong and unabated to this day — the tradition is safe. Bata Bangladesh has about 1500 regular and efficient employees and workers, who are highly committed to uplift the company’s performance with high productivity and sales through maintaining the quality. In recent times Bata Bangladesh has launched more than 180 new designs for different brands in their men, women, children and infant categories. Eventually they have received excellent responses from their various target groups on the new designs. Personalized service: Qualified and enthusiastic sales associates are engaged who take customers’ satisfaction to heart. In many countries customer service goes beyond the stores with home deliveries, orders made possible via catalogues, the web or even call centers. Guaranteed customer satisfaction. In any Bata store in the world they repair, exchange or refund any products with defects. They also exchange or refund on unworn merchandise if one changes one’s mind. Proof of purchase is required for refunds. Bata Shoe Company has been successfully running for years with a mission and vision at the heart of all its operations. Management of Bata Shoe Company (Bangladesh) Ltd.
Table: Management of Bata Shoe Company (Bangladesh) Ltd.
Organogram of Bata Shoe Company (Bangladesh) Ltd.
Chittagong, Sylhet, and in Mymensingh metropolitan area. These stores are established in prime locations, and provide a high level of customer service, exclusive shoe lines with complementary accessories and contemporary shopping environments are to discerning shoppers. Bata Shoe Company is undoubtedly the world’s leading family footwear chain. The company offers a wide assortment of everyday’s fashion footwear. The products are primarily of the brand Bata. Nevertheless very carefully selected articles from both local and international brands are also marketed by the company. There are 60 family stores till date that has been successfully operated all over the Bangladesh. 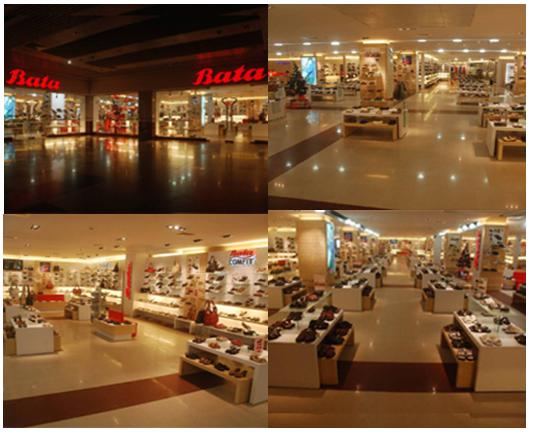 Bata Bazar is the largest display of Bata’s products among all others store concepts. It provides the customers with broadest range of products and accessories possible. This concept was introduced in 2003. They are ideally located in power centers commercial parks and outlet centers with easy parking facilities. There are 73 Bata Bazars being operated. Bata offers a number of product lines to the prospective consumers in the existing market, Bata has a truly international team whose diversity of ideas to develop new style foot wear, shocks, sneakers, etc. Bata has introduced huge product line of men footwear- shoes, sandal, sneakers, shocks, women footwear, kid’s footwear and many other types of footwear line the company is operating in the market. About half line of product the company imports and sells under the franchising. Bata also sell ten international brands footwear at their retail shop. 4ta has been delivering hand-crafted quality footwear over 100 years to maintain and build on heritage of creating high quality, comfortable and stylish shoes. The weinbrenner shoe line is made up of leather shoes and boots, style in low, mid, and high cut. Cuts or design are directly fashion, but can include materials which help to feel comfort in doing outdoor strong works. The shoes are casual in style closures generally with laces and eyelets, sometimes supplemented with hooks, D-rings and straps with buckles. Nike is a worldwide famous and popular athletic shoe brand. Bata carries this brand as a licensing. This brand is for a different segment of customers in Bangladesh. Though it is an athlete shoe but in Bangladesh young generation wear it as a fashionable product. The target customer of this product is higher income group people. Power is also an athlete shoe which is considered as the alternative of Nike. Power shoes are cheaper than Nike shoes. The target customer of this shoe is middle class people. North-Star is a trendy shoe focused to the young customer group. This shoe is cheaper than Nike and Power. This is considered as a seasonal product as the demand increase in winter. Comfit has an important feature in design and assembly of all the comfit shoes. This brand is focused on both comfort and style of shoes. Unit rubber, PVC, PU or TRR sole are commonly used in this brand. “Get comfortable today” is a tagline commonly associated with this range of shoes. Sandak is plastic made bata product for lower income people to use in every season of the year. This shoe is also made for rough use for all level of customers. Bubblegummers is the leading children’s footwear brand in Latin America and has developed an extensive presence in Asia and in Europe. Bubblegummers offers quality, comfortable, funny and colorful shoes for the 0 to 9 old that assure the healthy growth of a child’s foot. Bata is the old and own brand of Bata Shoe Company. But by the time being this brand is updated to fulfill the customers demand. Marie Claire shoes are for women with an active lifestyle who seek contemporary modern styles. Marie Claire shoe stores successfully opened in Latin America and Asia. Bata Brands is the trademark owner of Marie Claire for shoes worldwide (except in Japan and Korea). Footwear beyond Safety Bata Industrials is a specialized division of the Bata Group producing industrial and work-related footwear, hosiery and accessories. Scholl is a female brand which is focused for the school going girls. Bata City: The City Stores incorporate spacious floor space allowing a comfortable shopping experience, modern interior decor enriched with novel shelving systems, fittings, fixtures and lighting. The city stores are established in prime location of metropolitan city. Among the 25 city stores 16 are established in Dhaka and others in major business area. Bata Bazar: Bata Bazar holds the largest display of Bata’s products consisting wide range of assortment. It provides the customers with broadest range of products and accessories in a different price range possible. But exclusive brands and products are not been sold here. This concept was introduced in 2003. Bata family: It is more a like a clearance outlet. Most of the products which are been sold here are in sale. These three types of stores are serving different segment of target market and adding a new value in customer satisfaction. Bata use Price-Quality Leadership approach. They set the price based on value. In some country they target high quality niche and in some country price sensitive segment. Everywhere they set the price based on value they delivered. Among all those promotional activities they have emphasized on outdoor advertising in Bangladesh.